Recycled Intermediate Bulk Container (IBC) previously used for food use. Will be thoroughly jetwashed and rinsed prior to dispatch. Suitable for the static storage of pure water or other liquids. IBC tanks, or Intermediate Bulk Containers, are ideal for safely transporting and storing pure water for window cleaning (or other liquids). These 1,000 litre IBC water tanks are made from high-density polyethylene plastic and are UN approved for heavy duty water storage. Stainless steel cages are also available for these 1000ltr IBC storage tanks, to provide a steel frame for additional strength. Our IBC containers sit comfortably and can be moved about on a plastic pallet, wooden pallet, or with a forklift. 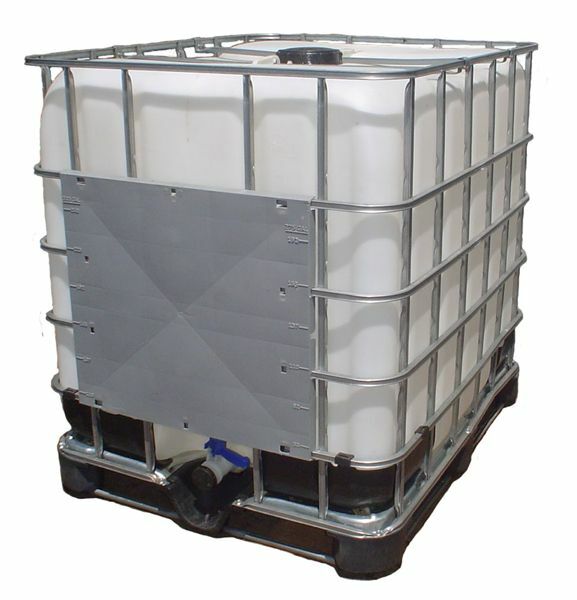 IBC plastic tanks are popular in many industries for storing non-hazardous materials. We sell food grade storage containers that have been repurposed to store window cleaning pure water. Don’t worry, all of our 1,000 litre IBC containers will be thoroughly be jetwashed and rinsed prior to dispatch, and will arrive in good condition. Check out the rest of our water storage tanks and plastic containers. Contact Us if you have any questions. Please be aware that tanks are delivered on a 2 working day service.